"In the Navy this is served over toast at breakfast." 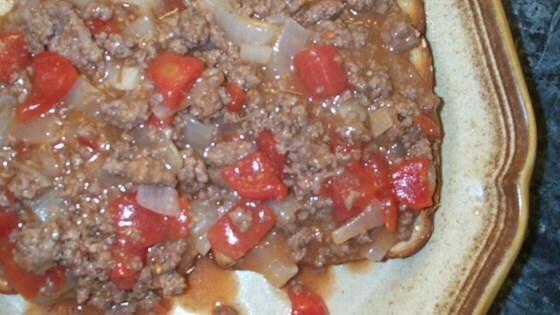 In a large skillet over medium heat, cook the ground beef and onions until beef is evenly browned; do not drain. Season with salt and pepper to taste. Stir in flour 1 tablespoon at a time, until beef juices have been absorbed. Stir in tomatoes, tomato juice, and water. Simmer on low heat to thicken. Stir in nutmeg and sugar; simmer until flavors are blended well. One of the few dishes in the Navy I could keep down. Served at most of my commands every Sunday for brunch! We called the stuff "s*** on a shingle" but we sure ate it. This recipe eats better than I recall the original did. The hungrier you are, the better it tastes.